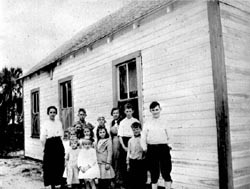 "Captiva School" & "Chapel By The Sea Historic District" was recognized by the National Register of Historic Places in 2013. Situated adjacent to the Gulf of Mexico beach and among palm, seagrape, and gumbo limbo trees, the building was originally constructed in 1903 for use as a county schoolhouse and in 1921 was purchased from Lee County's "Board of Public Instruction" by three Captiva Island citizens, identifying themselves as "Trustees of Methodist-Episcopal Church South". During those school years, the building was also used for religious services whenever a circuit preacher would be in the area. Because of the infrequency of those religious services, at a time when Captiva Island was growing in population, the chapel (then known as the Wayside Chapel) evolved into the Chapel By The Sea and services were then held with more regularity with a circuit preacher brought over, often by ferry, from the mainland. Regularly scheduled Sunday services began soon after the Chapel By The Sea was re-organized in 1948 with H.G. Pearce, D.D. followed by Rev. C.W. Kennedy serving as resident ministers for the first (November through Easter) season. Captiva Chapel By The Sea incorporated in 1952 and was purchased from the Methodist Conference in 1954. The parsonage was built in 1965. Today Captiva Chapel by the Sea is a seasonal, inter-denominational, mission-oriented congregation "seeking to behold the face of God in everything and everyone". Worship services are held at 11:00am every Sunday from the 2nd Sunday of November through the month of April. We welcome all...anytime of the year! One of the treasured traditions of Captiva Chapel By The Sea is our Christmas eve service, enjoyed now-a-days by locals and by visitors from around the globe. The evening service concludes when worshipers from within the chapel join those gathered outside; each with a lighted candle, and Christmas carols are sung while gulfshore waves lap closeby. This Christmas Eve candlelight caroling has been a tradition at Chapel By The Sea since 1950, when the first such service was held.